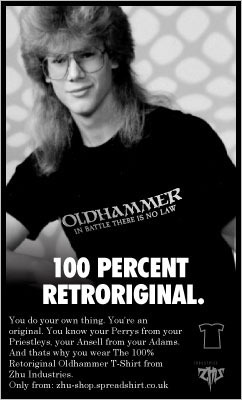 Oldhammer T-shirts - Reverse Flash Sale! 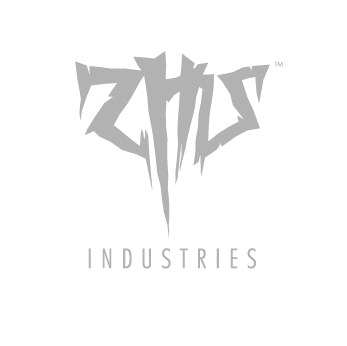 From friday the prices of all Oldhammer / Rogue Trader t-shirts in the Zhu-shop will increase to £19.99. The main reason for this is that the way Spreadshirt cost their stock is changing and this has a lot of knock-on effect on the way the things in the shop are priced. Not to worry tho' as any order placed today or tomorrow AM will be at the original bargain price! Meanwhile, anyone who bought the "first edition" Oldhammer in Battle There is No Law t-shirt in the khaki green may be pleased to know the edition has now sold out, and they have a genuine rare, OOP, ltd. edition original Oldhammer T-shirt. A huge thanks to everyone who has bought one (or three!) so far. NB. I am only responsible for producing the designs, not the manufacture or distribution of the garments. Please check Spreadsheets generous returns policy and check sizing before placing an order. Shirts might smell a bit weird due to the manufacturing process, just wash them before wearing the first time. Spreadshirt share only limited customer data with designers, so I won't get your personal details or banking information. In which I take onboard the task of a brief review of Ksárul Speaks Again! from my sadly miniscule collection of Trollcrusher zines. Written by Stephen Foster - the oracle of Artificial Intelligence KSRL IVB. And there, an already interesting idea thrown into the pot - that deities of Tékumel are actually artificial intelligences from pre-times-of-darkness, tho' a cursory look over the Blue Room Archive suggests this is an unlikely prospect, as the remaining robots on Tékumel are unable to use other-planar energies, it may be that the technology was so advanced, or alien that the AI gods operate on different levels. Oh yes, and this is 1979. William Gibsons Cyberspace wandering Voodoo Loa won't hit until Count Zero in 1986. Evasion - chance of leaping out of the way of the physical explosion. Physical Resistance (i.e. the effect of being sat on by an elephant). It makes sense technically and errs towards more simulation and differentiation between magical effects, but it seems a little complex for the gains in realism. 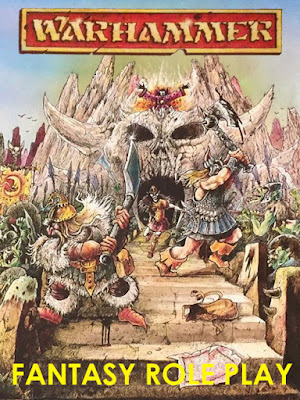 Then there's some explanations on The Tomb of Klorvetus (published in a previous Troll Crusher) which was a dungeon that apparently was a bit too tough, and situated in Judges Guilds City State of the Invincible Overlord setting. We then get to the meat - Some Additions to the List of Eyes - some 13 Eyes for The Empire of the Petal Throne. For those unfamiliar with EPT or Tékumel an Eye is a small, spherical, ancient technological device that does magical things, roughly the equilivant of how magical wands work in Dungeons & Dragons. The majority of Stephens Eyes are of a combat nature, either offensive - such as The Eye of Sublime Zephyr - which produces a Wall of Wind, or defensive such as the Eye of The Charmed Barrier which creates a forcefield. I like very much the Eye of Non-Functioning which simply deactivates all eyes in the local area, which like the Thoroughly Useful Eye, has that oddly utilitarian aspect that makes the place come alive. 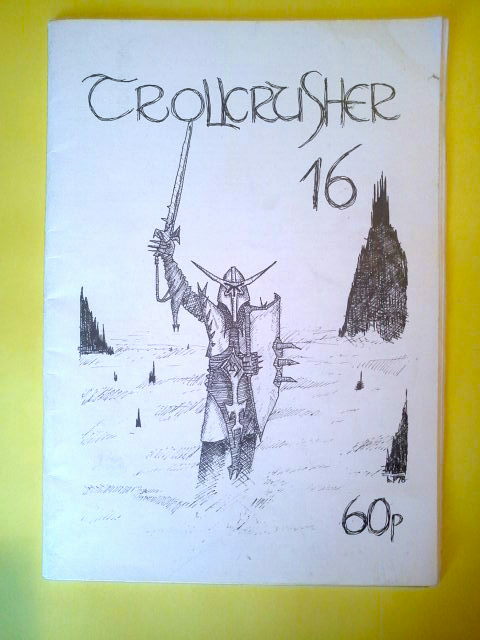 The rest of the issue has contributions from Laurence Miller, Hartley Patterson (famed for his News From Bree zine), Graham Coles Quivia city for D&D as well as all the usual blather you'd expect from a British D&D zine. Solid gold! Oh yes, and the cover up there of Trollcrusher 16 depicting a Champion of Chaos, with his spiked helmet and shield, inverted cross, raising his sword through the arcane mists and black jagged peaks of some unearthly domain, is an early masterpiece by none other than Oldhammer fan favourite illustrator and miniature designer and sculptor Jeremy Goodwin, whose sculpts and designs for Chaos Champions are regarded as some of the finest and most characterful miniatures produced under the Realms of Chaos banner. Jez did the back cover too, and it is a thing of utter grim and frostbitten eldritch tr00 kvlt beauty so shall remain unseen, lest it's unholy awesomeness does send lesser denizens of the interwebs insane. 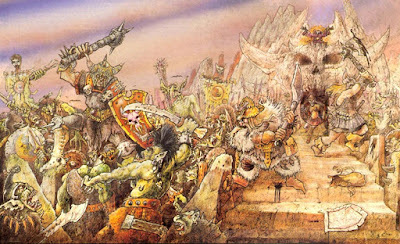 One of the things I like about 2nd Edition Warhammer Fantasy Battle, is that it keeps bringing up new items - the range of inserts and additional sheets that went in at different times during its production means there always seems to be something new, although that's probably just because nobody has bothered to catalogue all the ephemera. This yellow flyer, which I certainly didn't get when I bought Warhammer 2nd Edition back in the day, nor did I get it when I bought another copy of eBay some years later (although I did get some bendy D&D toys with it!) Anyway, this arcane scroll mentions two Warhammer posters. 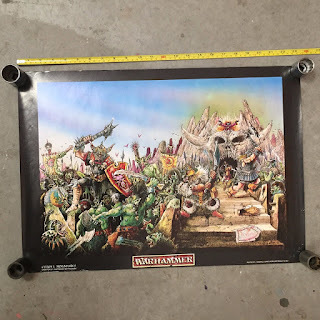 One of the posters is the Joe Dever and Gary Chalk one that Goblin Lee did an epic job of identifying the miniatures of in his post on Warhammer Posters . 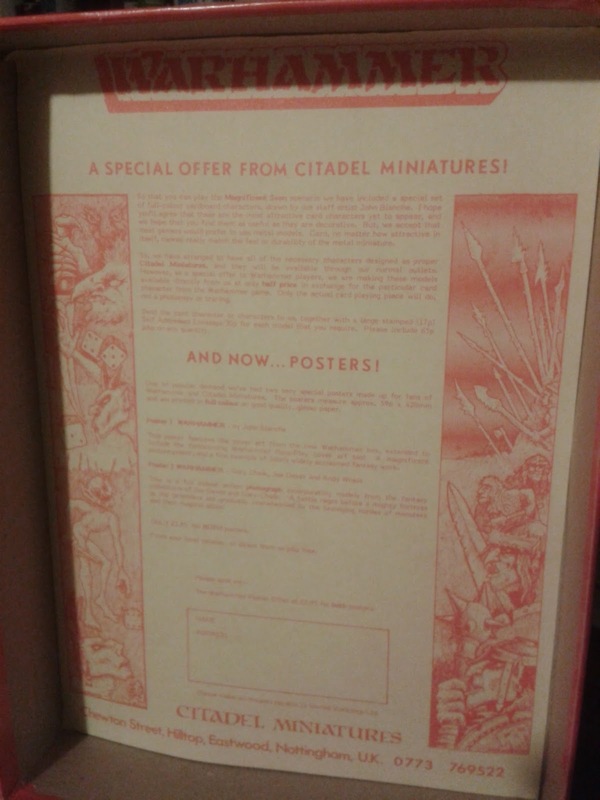 Both posters were also mentioned in Chalk and Devers Tabletop Heroes column in White Dwarf 62 - February 1985, so that puts a possible date on the insertion of the flyer, as Warhammer 2nd Edition came out late 84, there may have been a few months when WFB2 was distributed without yellow flyer advertising the posters. "This poster features the cover art from the new Warhammer box, extended to include the forthcoming Warhammer Role-Play cover too! 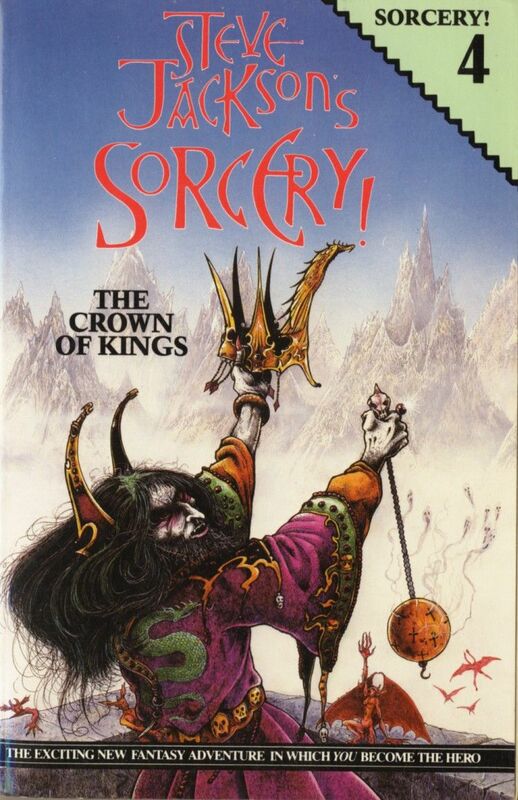 A magnificent picture poster, and a fine example of John's widely acclaimed fantasy work." 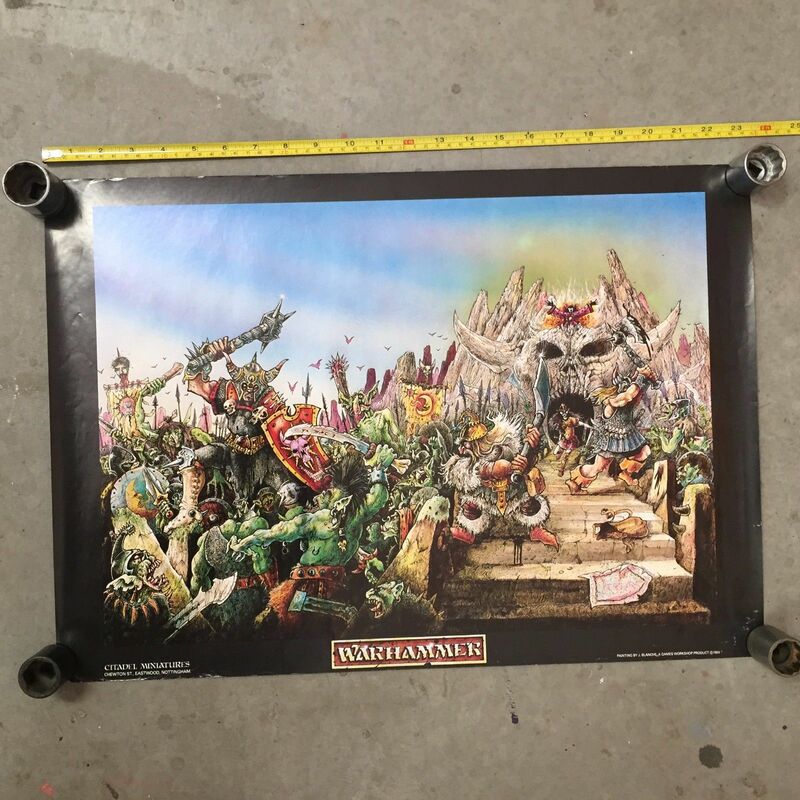 Some further observations - the 3rd Edition reprint has airbrushed clouds going in the opposite direction to the poster, the pole-arms of the orcs on the left and the bats (or Stirges) have been removed or replaced. 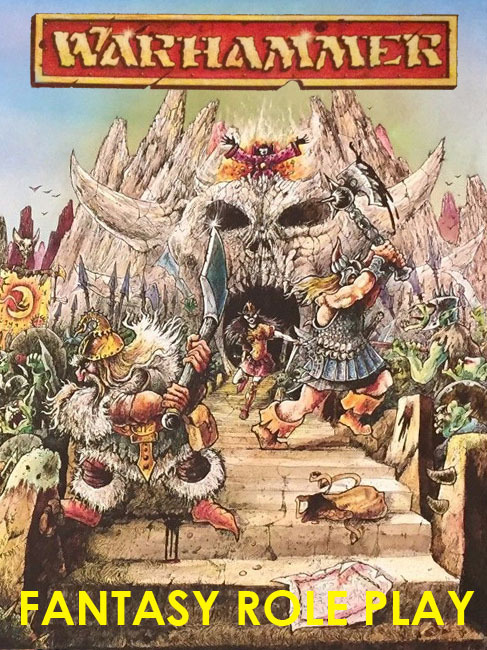 Visually it feels like there is more image missing on the right-hand side - otherwise it wouldn't have had the same proportions as the WFB2 box art - the composition of the skull-face is also weirdly off-centre, and the cropping of the monolith to the right of the stairs very cloes and. Looking at the poster there is a lot of 'air' in the design - obviously for the logos and publishers blurb, and in fact it looks very much like a 2-in-1 image one that would have made for a wrap-around cover, rather than a box front. 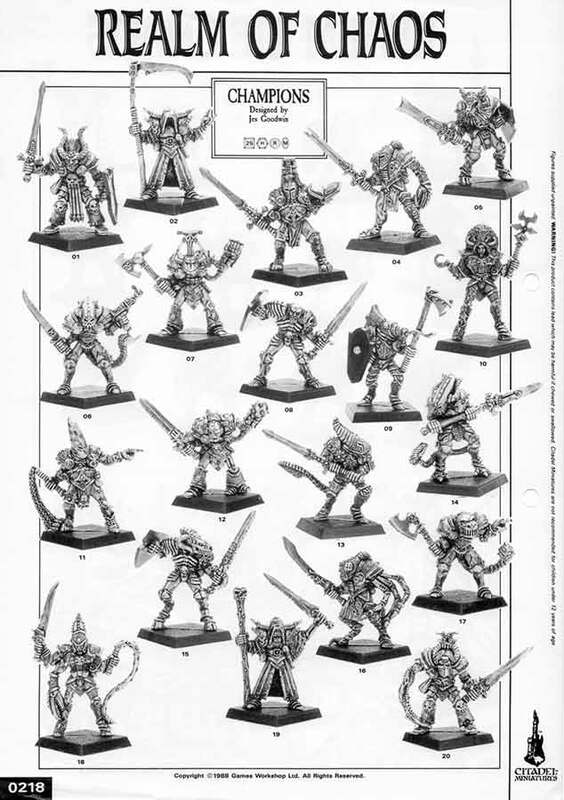 But, perhaps more importantly than these visual details is the additional content on the right-hand side, that the flyer says was intended to be the cover of Warhammer Fantasy Battle. 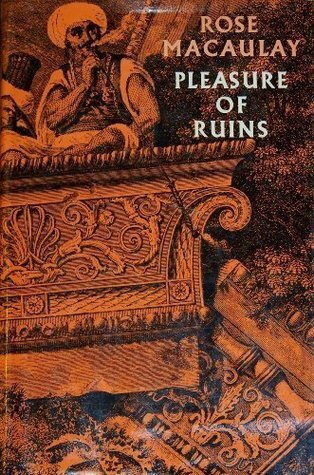 This isn't a Grim World of Perilous Adventure, nor the gritty fantasy, gothic adventure of rat-catchers in Medieval Cthulhu sewers getting bitten by syphellitic dogs, nor The Enemy Within that we know from Warhammer Fantasy Role-play. No. It's heroic blood and gore outside Castle Greyskull. Not only that but it has a wizard who looks like Archmage of Mampang, with an explosion coming out of his backside, standing a top of said Castle Greyskull. Not only that but it's got what looks like a woman on it, running out of the mouth of Castle Greyskull. In the front middle. The colouration makes me think maybe she's a Dark Elf or similar - tho' the costume is exactly the same as the Runequest 1st Edition (and 2nd) illustrating what I believe to be the incalculable debt that Warhammer owes Runequest, whilst also continuing Warhammer 2nd Editions all too brief attempt at gender equality. There you have it a weird, half-baked reconstruction of what might have been. 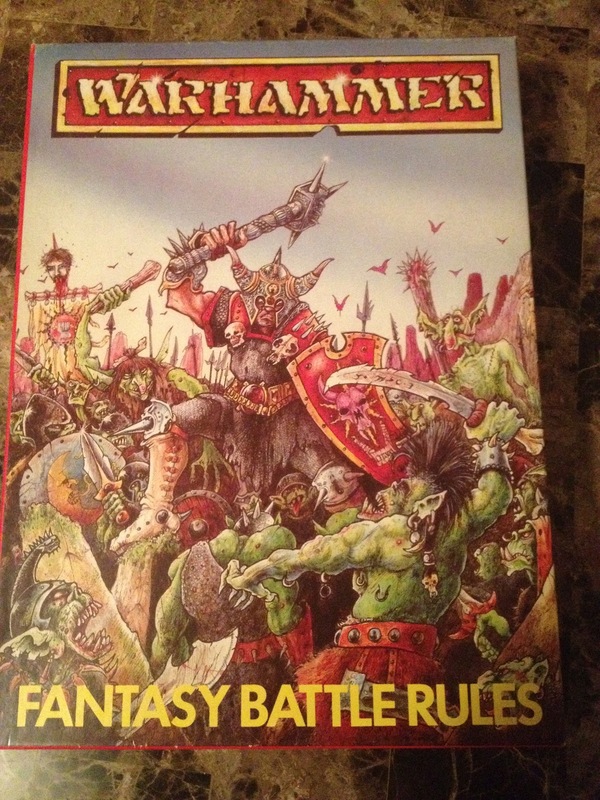 So what if Warhammer Fantasy Role Play had been published in 1985? We know what the cover may have looked like, but what of the game itself? 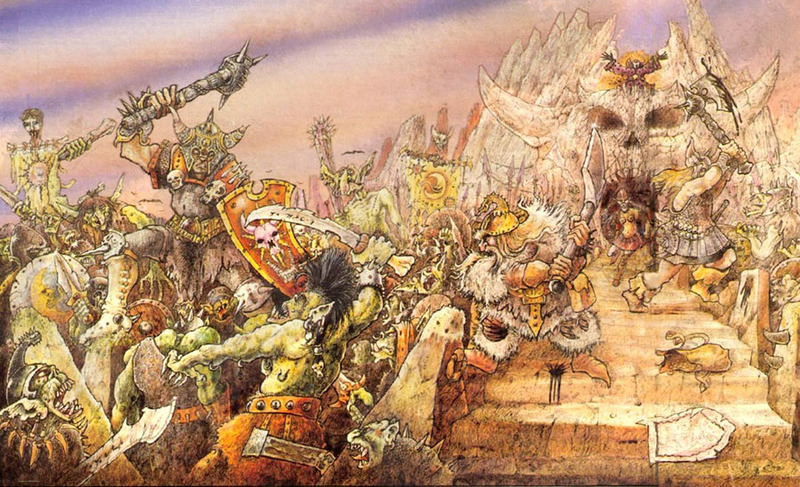 There are hints in the Winter, 1985 Good Games Guides WFRP adventure Web of Eldaw by Rick Priestly, and we know from interviews that Fellowship and the change to 2-digit stats were late changes, so it likely would have mechncially hewn closer to Warhammer Battle Second Edition. The Careers system may well have been in place, but as published it lacks any focus outside of the Empire (that Dark Elf warrior maiden, must surely have had options)? 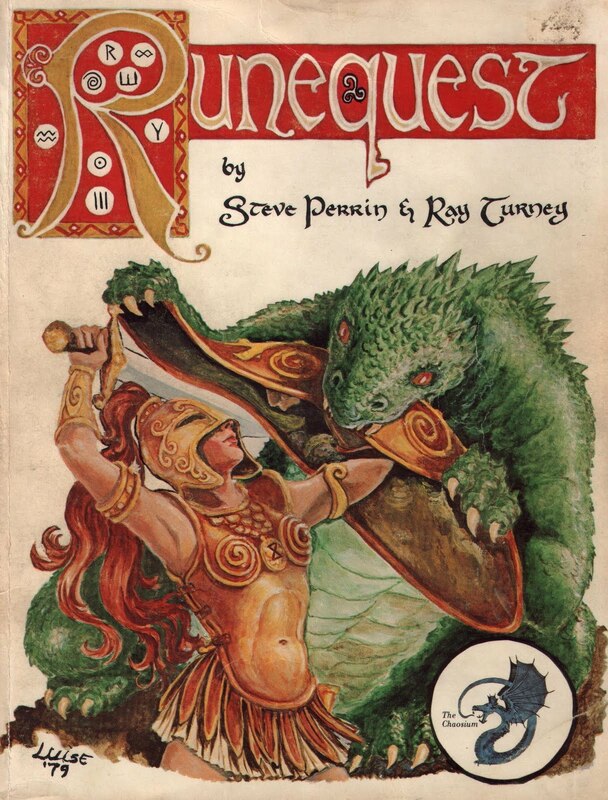 Would the Enemy Within and all the Renaissance Call of Cthulhu have been sidelined for the Doomstones Campaign and replaced with funky sci-fantasy South American Runequest or the myriad loosely defined realms of Fighting Fantasy?